Knowledge is power, and we love how the online resource, Healthy Child Healthy World helps us informed about on how to protect our kids from harmful chemicals. You can also join in on the discussion and learn with their inaugural Summer Luncheon. This annual event will allow you to learn and share about how we can all take action to protect our children from harmful chemicals in our food and everyday products we use. 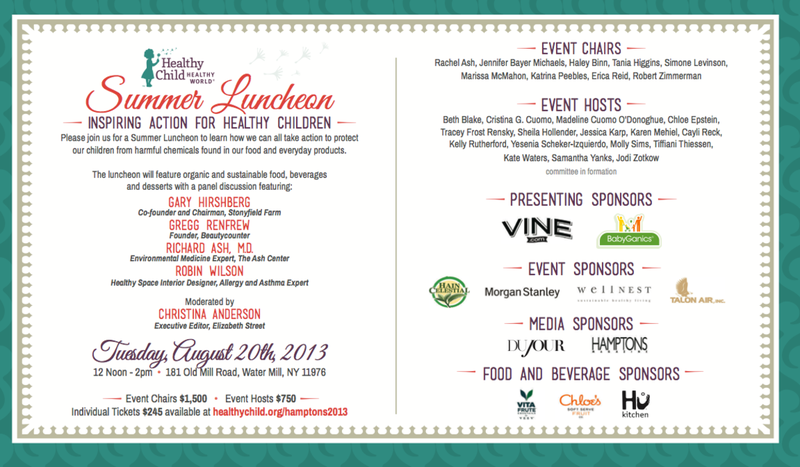 The 2-hour luncheon will welcome 150 tastemakers, parents and influencers dedicated to a safer and healthier lifestyle. The event will include organic and sustainable food, beverages, desserts and gift bags featuring non-toxic products. Guests will also have the opportunity to purchase from a number of sustainable and environment-friendly vendors - products range from jewelry to beauty collections. A percentage of proceeds from the purchases will be donated to support the organizations efforts and mission to inspire action for healthy children.